Nothing sounds quite like a Harley, but that doesn't mean you don't want quality audio when you're on the road. 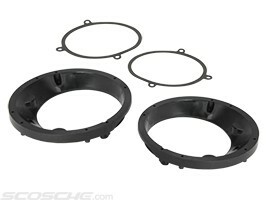 Now you can install standard 6-1/2" aftermarket speakers on select Harley-Davidson motorcycles. These mounting brackets are designed to fit all models equipped with a factory fairing, including the Road Glide. Important Note: Some 6-1/2" speakers use a larger frame and require a larger cutout. We call these 6-3/4" speakers, and they won't fit in this adapter.